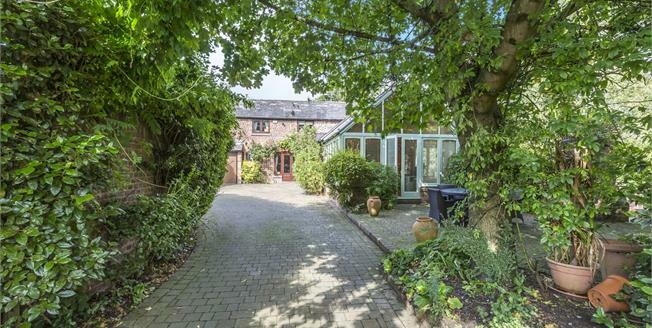 Hidden away, but by no means secluded, Withy Barn is approached via private road. Through the gates you are welcomed with the sight of this truly charming barn conversion dated back to the seventeenth century. A large, bright conservatory opens into the well appointed kitchen including a Range master oven and solid oak worktops. The spacious, open plan living/dinning room features a wood burning stove and French doors, allowing light to flood the room and views of the beautiful surroundings to be fully appreciated. Upstairs you will find two good sized bedrooms, two en-suite shower rooms and a stunning master bedroom with sliding doors leading into a luxury en-suite bathroom. Outside there are private gardens and a large integral garage which has a Belfast sink and plumbing for appliances. Full of charm and character, Withy Barn must be viewed to be truly appreciated.